SPROUTS FARMERS MARKET WILL BE INCREASING ITS HEALTHY GROCERY FOOTPRINT THIS YEAR: The plan is to expand to more than 250 stores in 15 states in 2017. Americold opened new facility in partnership with a healthy grocery retailer. Americold’s new facility increases capacity in the highest grocery spend region of the US. East Point site will be temperature-controlled distribution center for Sprouts’ southeastern operations. 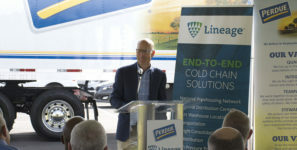 Americold, a global leader in temperature-controlled warehousing and logistics for the food industry, officially opened its most recent facility addition in East Point, Georgia. The 260,000 square-foot temperature-controlled site, purchased in July 2016, reflects the expansion of Americold’s partnership with Sprouts Farmers Market as Sprouts increases its healthy grocery footprint to more than 250 stores in 15 states in 2017. The East Point site will serve as a temperature-controlled distribution center for Sprouts’ southeastern operations, which will expand considerably in 2017. The site offers two temperature zones at 34 degrees F and 55 degrees F—ideal for the Sprouts’ fresh produce warehousing needs. In the United States, Americold owns and operates more than 145 facilities in every major food production and consumption market. The company has public refrigerated warehouses, port-specific facilities, customer-dedicated sites, managed facilities, and national less than truckload and truck load transportation programs.